Savvi Formal Wear is more than a wedding gown and tuxedo rental shop. 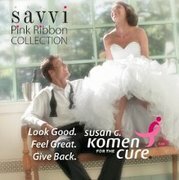 Savvi promises you'll look your best for every formal occasion. Whether ordering your Prom tux, cruise attire, a gown for a dinner dance, prom, awards ceremony, or quinceanera, Savvi offers you hundreds of the latest designer styles, including Calvin Klein, Ralph Lauren, Ellis, Ecko and Claiborne. Coupled with our commitment to service, we insure perfection for your special event.